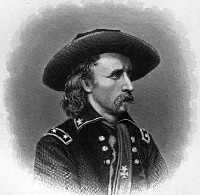 Born in New Rumley in northern Harrison County on 5 December 1839, George Armstrong Custer became one of the most famous and controversial military leaders in our country�s history. 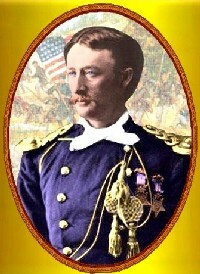 Following his graduation from West Point, Custer served the Union Army in the Civil War, rapidly rising in rank, attaining the rank of Brevet General. (For details on his Civil War service, please see: Civil War Biographies). After the war, he served throughout the west, meeting his death at the Battle of the Little Bighorn on 25 June 1876. A bronze statue stands on the site of George Armstrong Custer's birthplace. Only the foundation of the house remains at this roadside park and picnic area. Visitors at the exhibit pavilion may read about Custer's life and the spirited qualities of the young soldier whose "Last Stand" has made his name a household word. Custer became famous as a daring cavalryman during the Civil War. The Custer Memorial Association holds several events annually, including Custer days in June and a celebration of General Custer�s birthday. The Custer Monument is on the north side of State Route 646 at the west edge of New Rumley north of Cadiz, in Harrison County. Also born in Harrison County, Thomas Ward Custer, brother of General George Armstrong Custer, served and died at his brother�s side. He was the only soldier to receive the Congressional Medal of Honor during the Civil War twice. For details on Thomas Custer's Civil War service, please see: Civil War Biographies.